The Junior League of Gwinnett and North Fulton Counties wants to make a difference in the lives of young girls around our community. Our program, Strong Girls, Bright Futures is committed to empowering young women by building confidence to make positive decisions through a focus on leadership, personal development and voluntarism. We want to show girls how to be intelligent, strong, confident, creative, unique, and accomplished. We want them to feel secure, make positive choices, and think critically about the world around them. We strive to be positive role models for young girls through our actions and support organizations that teach girls to be empowered and make positive contributions to their communities. 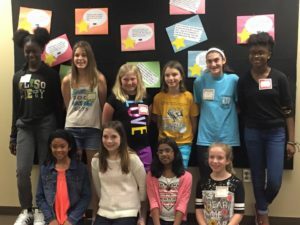 Our annual 2018-2019 Strong Girls, Bright Futures Workshop will be held on Saturday, March 23, 2019 at the Lawrenceville Boys & Girls Club.